The Afghan Hindus and Sikhs say they will not celebrate this year’s Diwali festival due to deadly incidents took place in the country recent months. The festival was not held last year either due to a deadly incident in Kabul. Hindus and Sikhs living in Kabul said that the death of 14 Hindus and Sikhs in Nangarhar bombing July, assassination of former Kandahar police chief Gen. Abdul Raziq and Helmand parliamentary elections candidate Abdul Jabar Qahraman are some of the violent incidents that have left them with no option rather than canceling the celebration of the festival. Diwali is a Hindu festival with lights, held in the period October to November. “How can we celebrate our happiness while everyday soldiers, ordinary people and elders are killed?” asked Narinder Singh Khalsa, Hindus and Sikhs representative. The Hindus and Sikhs said their safety has been fragile in the recent years as according to them many Afghan Hindus and Sikhs have left the country over the past years. “We don’t want to hold Diwali festival this year due to Jalalabad incident and the loss of important figures such as Gen. Raziq and Jabar Qahraman,” said Sorpal SinghKhalsa, deputy head of a committee of Hindus and Sikhs. Diwali is one of the most valued festivals for Hindus and Sikhs in the world and they celebrate it by music, fireworks and lighting candles. “In previous years, we were doing fireworks and based on the principles of the festival, our sisters were coming and we were giving them their expenses as gift and we were very happy,” said Cartar Singh, a resident of Kabul, who explained their excitement in Diwali celebrations of previous years. “This festival was celebrated widely in Afghanistan in previous years, but now our population has decreased here. In the past, we were 120,000 families in Afghanistan,”said Ragbir Singh, member of Hindus and Sikhs committee of Dharamsala in Kabul. Hindus and Sikhs have lived in Afghanistan for generations; however, various conflicts have forced many of them to leave the country and settle elsewhere. OTTAWA, Canada—UNITED SIKHS this week announced a call to action in the House of Commons alongside several members of Parliament to address the increasingly desperate plight of religious minorities in Afghanistan. After gaining the support of several policy stakeholders, including MPs Garnett Genuis, Elizabeth May, Cheryl Hardcastle, Harold Albrecht, Lisa Raitt, Arnold Viersen and Bob Saroya, following a series of targeted terrorist attacks against Sikhs over the summer, the non-profit human rights organization is now calling upon Prime Minister Justin Trudeau to urgently process asylum for minorities facing religious persecution. The news conference comes within weeks of a written human rights statement the organization submitted to the United Nations during a Human Rights Council Session held in Geneva, Switzerland last month. The three main areas of concern for religious minorities in Afghanistan, as outlined by UNITED SIKHS, are personal safety/security, religious freedom, and the right to life. As recent as last month, a marked uptick of attacks against Hindus and Sikhs across Afghanistan have become increasingly brutal. On Sept. 1, Satnam Singh and his son, who are both identifiable Sikhs, were shot and killed in their own shop in the Herat Province. This is believed to be the second marked attack on the Sikh minority after the Taliban orchestrated a suicide bombing on July 1, in which 13 Hindu and Sikh dignitaries were targeted and killed while on their way to a meeting with government officials in Jallalabad. In conjunction with the news conference, a petition of thousands of Canadian residents was formally submitted in the House of Commons, led by MP Garnett Genius, urging the Prime Minister to expedite asylum and grant the local Sikh and Hindu community with requested sponsorship. Building upon this effort, UNITED SIKHS will formally request a meeting with the Prime Minister and Minister of Immigration, Refugees and Citizenship. In addition, the organization will continue to raise the issue with members of Congress in the United States and Members of Parliament in the United Kingdom. NEW DELHI: The Government has authorised 16 collectors in seven states in the country to register as Indian citizens the members of minority community from Pakistan, Afghanistan and Bangladesh. The Home Ministry in a notification said any person belonging to minority community — Hindu, Sikhs, Buddhists, Jains, Parsis and Christians — from the three countries can avail the facility. Those who were given the powers are collectors of Raipur (Chhattisgarh); Ahmedabad, Gandhinagar and Kutch (Gujarat); Bhopal and Indore (Madhya Pradesh); Nagpur, Mumbai, Pune and Thane (Maharashtra); Jodhpur, Jaisalmer and Jaipur (Rajasthan); Lucknow (Uttar Pradesh); and West Delhi and South Delhi. The powers for registration were given to the collectors under the Citizenship Act, 1955 (57 of 1955), the notification said. Despite being dealt a major blow this year, Afghanistan’s Hindu and Sikh communities came out in full strength on Saturday to vote in the country’s parliamentary elections. For the first time since the fall of the Taliban in 2001 these two minorities are voting to elect a member of the lower house, a seat they will hold jointly. “This is our chance to put our representative in parliament,” Ram Prakash, a Hindu businessman from Kabul told The National. Their candidate, Narendra Singh Khalsa, is the son of original nominee Avtaar Singh Khalsa – killed in July in asuicide attack in Jalalabd. The blast killed 17 other members of the already dwindling communities. Mr Khalsa said he hoped to “end discrimination against the Hindus and Sikhs. A lot of Afghans are not aware of our history in the nation building of this country. They often think we have come from Pakistan or India. But we are natives of Afghanistan”. Despite official political representation and freedom of worship, many face prejudice and harassment as well as violence from militant groups, prompting thousands to move to India, their spiritual homeland. India has issued long-term visas to members of Afghanistan’s Sikh and Hindu communities. “Many more Hindus and Sikhs left after that attack. I don’t know the exact figures but around 700 to 800 Hindus and Sikhs remain in the country,” Mr Prakash said. The Sikh community now numbers fewer than 300 families in Afghanistan, which has only two gurdwaras, or places of worship, one each in Jalalabad and Kabul, the capital. Although almost entirely a Muslim country, Afghanistan was home to as many as 250,000 Sikhs and Hindus before a devastating civil war in the 1990s. Even a decade ago, the US State Department said in a report, about 3,000 Sikhs and Hindus still lived there. Today most are based in Kabul and Jalalabad, with a small community in Ghazni. “Every one of us in Kabul and Jalalabad came out to vote. However, our brothers in Ghazni couldn’t vote because of the issues there,” Mr Prakash lamented, referring to the delay in the elections in the Ghazni province owing to the security and political situation. The province was besieged for five days by the Taliban in August and the situation remains tense. Like most Afghans, their voting experience was affected by logistical and security issues. But Mr Prakash is confident he reflects the sentiment of the small but historical Afghan community when he explains that both Hindus and Sikhs are committed to bringing their representative into government. “He will be our voice in the establishment, and will ensure that our rights and our identities are protected. Because we are also Afghans and we should have a say in the government,” Mr Prakash explained. Being the only minority candidate running for a seat Mr Khalsa is likely to secure his place without any hurdles. Afghanistan’s marginalized Sikh and Hindu minority has decided to field its candidate for the very first time in the forthcoming parliamentary elections later this month. Narendra Singh, a young herbal medicine expert, has been nominated by the tiny minority as its candidate for the reserved seat of Wolesi Jirga (lower house). Afghanistan will go to parliamentary polls on Oct. 20 in which a total of 2,565 candidates will compete, according to the country’s election commission. The Afghan government reserved one seat for the Sikh and Hindu minority in 2016 along with some relaxations of rules. Speaking to Andadolu Agency, Singh, who is son of the community’s long-cherished slain leader Avtar Singh, said one of the biggest problems of Sikhs and Hindus in the country is that there are no dedicated schools where children can learn their own religions and native Punjabi language. Another problem faced by the minority is that there is no proper place to perform cremation rituals, he added. For years, the Sikh community in Afghanistan lived on the margins of the society. But, they were never targeted in the deadly fashion until Daesh terrorists blew-up a generation of its community leaders, including father of Narendra, in a suicide attack in Jalalabad city in July this year. Due to such threats, unlike public gatherings and roadside campaigns by other Afghan candidates, Singh’s electoral campaign for the forthcoming elections is literally confined to the few remaining temples in limited cities of the war-ravaged country. At a temple in the old Kabul Bazar area, the Sikh community gathered over the weekend to offer prayers for the victims of July bombing and to get to know about each other. Singh said the Jalalabad blast has taken away towering figures of the community, but the spirits of the community are still high. “We are devastated by the loss of our leaders, but we have not lost the morale. In Afghanistan, everyone is suffering for long. Our Sikh community and my Muslim friends are equally happy for me. We have no other option, but to fight and not lose the seat in the parliament we have been offered,” he said. “My father served as senator, and served the community for 22 years. People are sad at his demise, he had lost three brothers in Gardez city and now he also got killed, but he never thought about leaving the country. He used to say I have 14 members in my family for the service to the country and service to the nation,” Singh recalled. 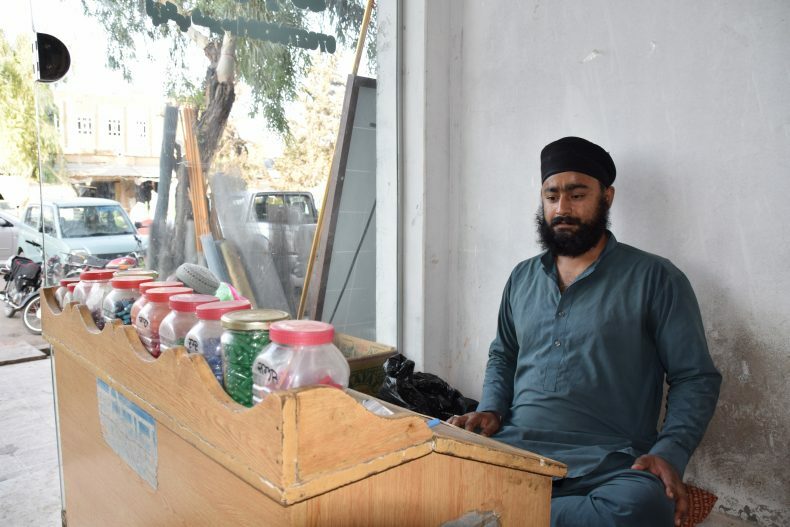 For ages, the Afghan Sikhs were known as leading traders in major urban centers of the country such as Kabul, Ghazni, Jalalabad and Khost, but they complain their properties, even temples have been encroached upon. Teyaan Singh, a senior member of the community, has seen time change from good to bad and to worst over the years. “Our community is frightened now, from 50,000 families we have been reduced to only around 200 families, all have escaped since the civil war in the 1990s, and all these temples are now deserted,” he said. An overwhelming majority of the Sikhs left behind are generally the poorest in the community. Narinder Singh is the only Sikh candidate in the upcoming Afghan elections. He is standing in place of his father, Avtar Singh Khalsa, who was killed in a suicide blast in Jalalabad last July. The parliamentary election will be held on 20 October and more than 2,500 candidates are reportedly standing in it. Both the Taliban and the Islamic State group have urged a boycott of the vote and there have been threats of violence. On 2 October, a suicide attacker killed 13 people and injured more than 30 at an election rally in Nangarhar province. 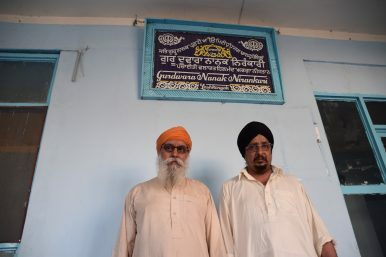 Atar (left) and Charan Singh (right) in the last remaining Gurdwara (Sikh place of worship) in Lashkar Gah. LASHKAR GAH, HELMAND, AFGHANISTAN – Like many other Afghans, Satnam Singh rides on a bicycle to work in his hometown of Lashkar Gah, the capital of the southern Afghan province of Helmand; that’s what he was doing on one day in early summer 2018. “But that day, a man on a motorcycle deliberately hit me and I fell,” Satnam recounts. The reason that he got knocked over was apparently because the style of his turban clearly shows that he belongs to Afghanistan’s Sikh minority, members of a religion that has its center in India and Pakistan. The incident might be small, but the seemingly never-ending nature of such harassment is – together with more serious threats and the dire economic situation – one of the main reasons that almost all Sikhs have left Lashkar Gah. In fact, as of summer 2018, only two Sikhs remain in Helmand, which is considered the Taliban’s heartland. The province is where U.S. and British forces suffered the highest casualties during the long Afghan war’s latest ongoing chapter, which started with the U.S.-led intervention after 9/11. The Sikhs have always been a small but native minority in Afghanistan; according to one account, prior to 1992, there were about 220,000 Hindus and Sikhs in Afghanistan with another putting that number as low as 50,000. By now, the very few remaining are concentrated in the provinces of Nangarhar, Kabul, and Ghazni. Until a few years ago, there was also still a tiny community of Sikhs in Lashkar Gah. During the Taliban regime in the 1990s, about 60 Sikh families were living in Lashkar Gah, Satnam remembers. They held out there despite the extremist Islamist rule of the Taliban, who forced non-Muslim Sikhs to identify themselves by wearing yellow patches. Satnam asserts though that, while the time under the Taliban was tough for Sikhs, things were worse in the preceding civil war – and the situation is also worse now. This was corroborated by other reports citing Afghan Sikhs. Hence, the exodus of Lashkar Gah’s Sikhs only began after the overthrow of the Taliban regime by the U.S.-led intervention, which was supposed to bring greater freedom for all Afghans, including minorities. “Since 2001 many left. And about three years ago, almost all of the remaining around 30 families of Sikhs decided to leave together,” Satnam said during an interview in July 2018. Virtually all of them, like the Afghan Sikhs that had emigrated before, went to India. “About two years ago, I sent my wife and daughter to my father-in-law in Kandahar [the capital of the neighboring province with the same name] and about a month ago from there to my father in India,” Satnam added. By now, he and his friend and neighbor Charan Singh are the only two Sikhs left in Lashkar Gah. “They throw stones at our houses, smash windows, and spray nasty graffitis on our walls,” he continues. Those allegations are proven by the dents and washed out scribblings on the wall of the house in a sleepy dusty street, where Satnam and Charan live and where they renovate the last remaining Gurdwara (Sikh place of worship) in Lashkar Gah. Such continued harassment is also confirmed by a 2017 report from the U.S. State Department, showing that the (albeit limited) freedom of religion that the Afghan constitution guarantees exists on paper, but hardly in reality. “And this harassment is not done by Taliban, but by ordinary local people,” Satnam adds, voicing desperation about the fact that he and his fellow Sikhs are treated like unwanted strangers in their own birthplace. Slowly, over time, this has become intolerable. In view of the aforementioned damage, however, this sounds like whitewashing the problems of Lashkar Gah’s last Sikhs by a police force that arguably needs almost all hands on deck to keep the insurgency at bay. In any event, Satnman also indicates many other issues that Sikhs face. For example, they would not be able to cremate the bodies of deceased Sikhs, the usual funeral method in their religion, as their Muslim neighbors see this as a sin. There are also threats. One letter that Satnam received demands all remaining Sikhs to pay a tax for non-Muslims and threatens that “bad things” will happen otherwise, with the original Pashto language implying that this is a death threat. The letter was sent in the name of insurgents, but its authenticity is unclear. The fact that on July 1 a suicide bomber specifically targeted Sikhs in an attack in Jalalabad, the capital of the eastern Afghan province of Nangarhar, that killed at least 19 people (most of them Sikhs) and wounded 20 more, shows that threats have to be taken very seriously. It should be noted, though, that said attack was claimed by the self-declared Islamic State, a group that is known for much more ruthlessly targeting civilians and religious minorities than the Taliban. Hence, as the self-declared Islamic State has no known presence in Helmand, such an attack against Sikhs appears significantly less likely here than in Nangarhar. Be that as it may, in the wake of the July 1 attack, Afghan President Ashraf Ghani assured Afghan Hindus and Sikhs that the government is not indifferent and will protect them. However, before this presidential assertion, Satnam stated that he does not have much confidence that the government can effectively protect them. Another Afghan and member of the (Muslim) Hazara minority that is also targeted by extremists summed up how bad the overall situation for the Sikh in Afghanistan is: “To be a member of a minority in Afghanistan is hell; but to be a Sikh means being in the innermost circle of hell,” he said. Satnam Singh, one of the two last Sikhs in Lashkar Gah, in his herbal medicine shop in his hometown. Photo by Franz J. Marty. Another reason for the Sikh exodus is the dire economic situation, which was also noted by the 2017 U.S. State Department report. “I left Lashkar Gah for India about two and a half years ago,” Atar Singh, another Sikh who was visiting Lashkar Gah in July 2018, told The Diplomat. “The reasons were the war, the harassment, and the fact that there was no work,” Atar, who used to be a cloth seller in his native Lashkar Gah, added. Asked whether he would leave Lashkar Gah, if there was an alternative – another place where he could live and work – Satnam answered evasively. First, he said that there is no good alternative. When pressed again, he replied: “I will stay in Lashkar Gah until there is absolutely no possibility any more to do so.” Although he never stated this explicitly, one main reason Satnam is still holding out in Lashkar Gah is apparently that he simply does not want to leave his home, the place where he was born and grew up. Echoing this, Atar, who – not without pride – mentioned that he had served seven years in Afghanistan’s army in the 1980s, at one point melancholically said: “This is our homeland too.” That’s a fact that many of their Muslim neighbors seemingly ignore. But with only Satnam and Charan remaining, there is a very real danger that the Sikhs will disappear from Lashkar Gah and – even though there are still Sikh communities in places such as Ghazni, Kabul, and Nangarhar – maybe also from Afghanistan as a whole, especially as those other communities are not that numerous anymore. The U.S. State Department report from 2017 cited estimates that there are only 245 Sikh and Hindu families with about 1,300 individuals left in Afghanistan. Franz J. Marty is a freelance journalist based in Afghanistan. He writes on a broad range of topics, but focuses on security and military issues. Follow him on twitter: @franzjmarty.